Coleraine players and fans celebrate Jamie McGonigle's late winner. 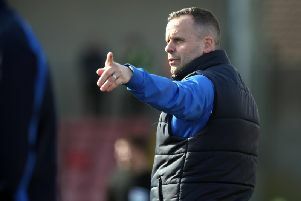 A stunning second half comeback saw Coleraine shoot down Cliftonville and move level on points with Crusaders at the top of the Danske Bank Premiership. A Stephen Dooley strike and a late Jamie McGonigle penalty sealed the win for the Bannsiders after Jay Donnelly had given the Reds a first half lead. Donnelly was first to threaten as his shot on the fourth minute cannoned off the upright. Coleraine found their rhythm and should have done better on 22 minutes when Aaron Burns found space in the box, but he fired over on the turn. The visitors broke the deadlock on 37 minutes as Donnelly latched on to a clever flick from Gormley before surging past Kane and driving a low shot towards goal, which Chris Johns looked to have covered, but the ball squirmed underneath him. Joe Gormley went close with an effort straight after the restart. But the Reds suffered a blow soon after as both Gormley and goal scorer Donnelly left the field with injuries. Coleraine introduced Eoin Bradley from the bench and immediately looked to have more attacking intent. Darren McCauley had a shot cleared off the line by Jamie Harney on 50 minutes. Harney then threw himself in front of an Aaron Burns effort as Coleraine threatened again, before Neeson did well to tip over a header from Dooley. Stephen O'Donnell went close with a couple of headers before the Bannsiders drew level on 72 minutes. Dooley got a flick on Traynor's centre and the ball bounced off a Cliftonville defender before the forward lashed the loose ball past Neeson into the bottom corner. It was all Coleraine now and they went close again on 78 minutes as McGonigle surged into the box before picking out McCauley, his shot was blocked, the ball bobbled about the goal mouth before McGonigle hooked it over the bar. Seconds later Josh Carson stung the palms of Neeson with a volley from the edge of the box. The keeper pulled off another great save to deny McCauley down low at his near post with four minutes to go. The hosts grabbed the winner with four minutes to go after Coleraine were awarded a penalty as Bradley was brought down by Grimes. McGonigle kept his cool to send Neeson the wrong way and fire the Bannsiders level with the Crues.